Tamir will stop at nothing to see Neriah take his rightful throne, but will their love survive? 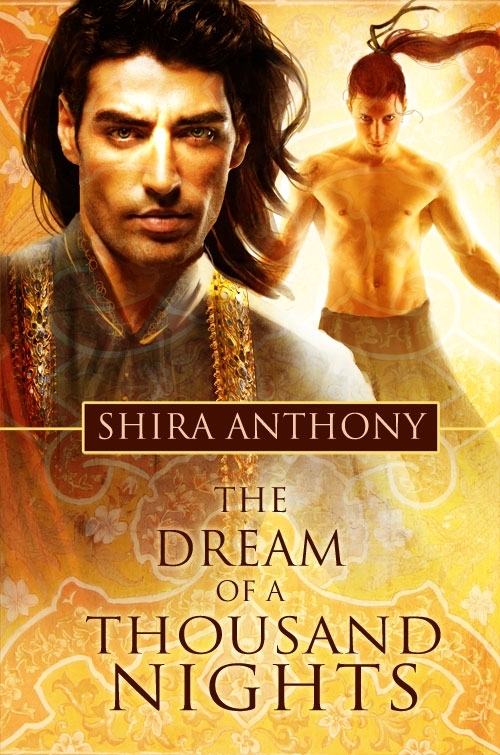 The Dream of a Thousand Nights by Shira Anthony, available from Dreamspinner Press. Neriah, the crown prince of Tazier, escapes his father’s deadly wrath with the help of a Jinn named Tamir. Knowing that the other Jinn would find and punish him for falling in love with a human, Tamir takes Neriah’s memories of their brief time together and leaves him with only a jade pendant as a token of his love. Tamir is then stripped of his powers and imprisoned for his crime. Can Benny and Curtis overcome an outside enemy and their own doubts? One More Wish by Devon Rhodes, available from Dreamspinner Press. Benny Oshiro is having the time of his life at a private gig for his band, One Wish, until he’s assaulted and kidnapped by their former manager. When his rescue—or more accurately his rescuer—gets a little hairy, Benny knows he should reconsider their sparking attraction, but no one has ever looked at Benny with the naked want that Curtis does—want Benny can’t help but return. Curtis Salinas knows at first sight that Benny is the only one for him. But now is not the time to test Curtis’s newly developed control. Outside forces are at work, threatening to expose his family’s secret, and when Benny is kidnapped a second time, Curtis realizes the enemy he’s searching for is only half the problem. To ensure a secure and happy future, he must also face down his doubts and claim Benny for his own. Raden’s heard all the tales about the vampire known as the Regent. As infamous for his power as for his irresistible good looks, the Regent doesn’t care about Vampire Law—he makes his own law. No one dares defy him. He does what he wants, when he wants, and what he wants now is Raden. Captured and dragged to the older vampire’s underground lair, Raden is about to discover the truth behind the tales… and what the tales don’t tell. Will Snow let go of his pain to save the man who saved him? Snowdrop by Augusta Li, available from Dreamspinner Press. Will Gabe and Jamie be enough to save Sei’s life and keep him from losing his humanity? 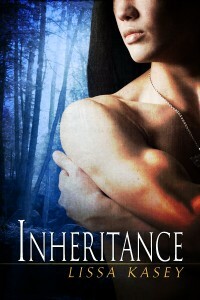 Inheritance by Lissa Kasey, available from Dreamspinner Press. Can Ean and Adam find the balance to support their lives together? 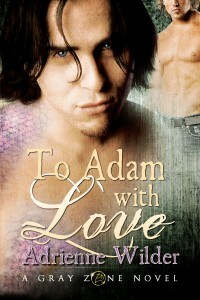 To Adam with Love by Adrienne Wilder, available from Dreamspinner Press. Every Cornishman comes into the world with the soul-deep knowledge that his land straddles the narrow shallows between the solid rocks of English practicality and the ocean of myth that lies beyond. Jamie Tregellis has no time for old men’s tales; working at The Lamb Inn keeps him too busy even to pine for his lost love, Will Andrewartha, who’d split Jamie’s heart in two when he left to become a sailor. Will promised to come back for him, but Jamie had long since given up hope – until one night he hears a noise in the stableyard…. Can Querry and Reg stop Lord Thimbleroy from draining Halcyon’s magic? 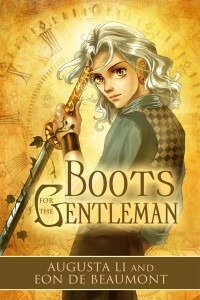 Boots for the Gentleman by Augusta Li and Eon de Beaumont, available from Dreamspinner Press. Though Reg has no answers for him, Querry learns there is indeed something precious in the house, something Reg is convinced will bring nothing but trouble. The armed guards that attack the thief prove Reg’s prediction true, and he can’t leave Querry to face it all alone. Not when Reg’s feelings for the man may not be as extinct as he’d thought. The trouble is, Querry’s heart doesn’t just belong to Reg anymore, and surprisingly, Reg’s heart no longer belongs only to Querry. In the end, it may not even matter, because if Querry, Reg, and their hearts’ desire can’t stop Lord Thimbleroy from draining Halcyon’s magic, they won’t live long enough to regret their unresolved romance.